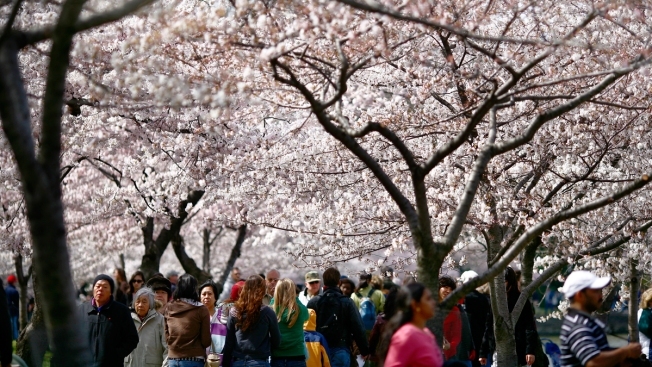 Spring's finally arrived, and that means we have a lot to look forward to: blue skies, short sleeves, ridiculously long lines at car washes... and, of course, the National Cherry Blossom Festival. What could be better than paddling around the Tidal Basin as spring comes into full bloom? Pedal past some of the city's most famous sights as you enjoy the scenic view of the blossom-lined basin. Find more info here. Two-person boats $15/hour; four-person boats $24/hour. If you'd rather take a kayak, head to Georgetown and depart from the Key Bride Boathouse underneath the Key Bridge, past the Kennedy Center, Lincoln Memorial and Tidal Basin to reach East Potomac Park, where the cherry blossoms frame the edge of the river. Tickets ($45) include sit-in kayaks, paddles, lifejackets and an instructor. Find music, family-friendly activities, cultural performances, arts and crafts vendors and plenty (seriously, plenty) of food trucks -- plus, of course, a spectacular fireworks show -- during the Southwest Waterfront Fireworks Festival. Admission is free; make sure to stay for the fireworks, which will illuminate the waterfront. Saturday, April 4, 1:05 p.m. The Washington Nationals meet the New York Yankees for an exhibition game two days before the season opener. If you order discounted tickets online here, the National Cherry Blossom Festival will receive a $5 donation for each ticket purchased. Saturday, April 4, 11:30 a.m.-4:30 p.m. Kids (and parents) can enjoy craft-making, live music, a gardening demo, and Tatebanko: Japanese Paper Dioramas during the Cherry Blossom Family Celebration. Admission is free. The festival's final weekend is capped off by a pink-focused parade and street festival. First, watch as blossom-themed floats, giant balloons, marching bands and famous entertainers cruise down Constitution Avenue. The parade is free, but if you'd like grandstand seating, tickets start at $20. This year's celebrity guests are yet to be announced. Saturday, April 11, 10:30 a.m.-6 p.m. The Sakura Matsuri festival is the U.S.'s largest one-day celebration of Japanese culture, featuring food vendors, crafts, 50+ cultural groups and performances, and plenty more. Tickets are $8 in advance online; day-of tickets are $10 online or at the gate, or $5 after 3 p.m. Kids age 12 and younger get in for free. Explore the city in a new way during a three-hour food tour, which will introduce you to a variety of Capitol Hill restaurants featuring cherry-infused dishes and drinks, as well as Japenese-inspired fare. Tickets are $49. Take in the beauty of the blossoms as you cruise along the Potomac River with your family and friends. Spirit Cruises is offering brunch, lunch and dinner cruises with a view in honor of cherry blossom season. Cruises with meals start at $45.95; sightseeing cruises without food start at $26.78. If you're interested in an especially spectacular view, consider Odyssey's Fireworks Dinner Cruise, which includes a three-course menu, live band and a great view of the fireworks during the Southwest Waterfront Fireworks Festival on Saturday, April 4. Tickets for the fireworks cruise are $124.90.